Travel expense management (TEM) has changed a lot in recent years. Especially Software as a Service (SaaS) tools have disrupted the way expenses are managed. What once were very innovative tools for risk-loving companies, has now become the gold standard in many companies. Yet, not all TEM tools are created equally. Are you thinking about making the jump with your company? This report lists 13 key factors to consider when choosing an expense management solution. With more than 1.3 trillion USD spent last year on corporate travel worldwide (GBTA, 2018), travel expense management is becoming more and more important for most companies. Corporations are actively trying to gain control of their travel and expense (T&E) budgets, and expense management tools are on the rise. This shouldn’t come as a surprise, as submitting, controlling and analyzing expense report data is a time-consuming and tedious task for employees as well as finance departments, that can easily be completely automated by TEM tools, such as Rydoo Expense. According to Gartner (2017), 54% of companies have already (partially) automated their expense control processes, while PayStream Advisors (2017) estimates this number to be already 63%. This number will only keep growing, making the market for TEM applications a double-digit growth area worth about one billion USD. Gartner (2015) estimates that there are more than 100 software vendors offering a TEM solution, so how do you choose the one that will be a perfect fit for your business? Spending some time and effort in choosing the right TEM application for your business will save you lots of headaches, frustrations, time and money down the line. A bad fit, however, between a TEM tool and your companies’ needs might result in low usage rates by your employees, frustrations, low-quality data, useless expense reports and time-consuming manual interventions might be required to keep everything running. To make it easier to choose the right tool, we compiled a list of things to keep in mind when looking at expense management application options. The following 13 criteria are critical when evaluating the different tools available. A TEM tool is only useful when your employees actually use it. User-friendliness is a key factor in deciding which travel management solution to adopt, as the last thing you want is to frustrate your employees with a poorly functioning or difficult to use application. Travel management solutions with high satisfaction and adoption rates will contribute to a more fulfilling work environment for your traveling employees and result in better expense reports and higher quality travel and expense data. Most providers of TEM tools today allow users to snap a picture of the receipt and upload it to the system. This is a great improvement compared to collecting all physical receipts and manually filling in expense reports. Yet, not all providers offer the same functionality with what happens with the pictures. Some providers still require users to manually fill in expense lines, while more sophisticated tools “read” the image and automatically fill in the expense report. These more sophisticated tools generally use Optical Character Recognition scanning (OCR) to convert (“read”) the image into data. Regulated industries require extra tools to ensure compliance with local laws. While some TEM tools are niche-players and have been developed to deal with the specificities of certain industries, most are industry-agnostic. To be able to serve these industries better, some of the industry-agnostic expense management systems have added specific functionality and reporting for certain industries such as financial services, healthcare, education and governments. Make sure to check whether this is the case for your industry. There is a great degree of differentiation between the different TEM solutions when it comes to “localization”. Every country has different regulations and laws when it comes to tax reporting, digital receipt requirements, mileage rates, per diems, etc. Understanding how well the TEM tool you are considering is adapted to your local market will save you many headaches in the future. This is especially important if you operate a multinational company and want to implement a TEM tool in the entire company. While some TEM tools take into consideration many of the local laws, others merely translate their app in the local language. Your perfect TEM solution should integrate seamlessly and effortlessly with your back-office. Many, if not all SaaS TEM tools provide integrations with accounting and administrative software packages and systems. Yet, not all of them will integrate as deeply or as easily. Choosing a TEM that will easily integrate with your current systems and automate workflows is therefore a must. While most – if not all – SaaS tools are available on different devices, including mobile, this is often not the case for on-site expense management systems. However, today’s leisure traveler is used to mobile consumer applications, and will no longer accept unpractical and mobile unfriendly systems. Business travel has no choice but to follow the consumerization trend. Having a mobile TEM application is therefore crucial for the satisfaction and adoption rates of your employees, and it will save them time while they are on the road. Pricing strategies vary widely across TEM tools. On-site software packages are usually more expensive, as you pay upfront for all the whistles and bells of the product, even if you don’t use them. They often work on a user license basis, with annual maintenance fees. SaaS solutions are often more budget-friendly, as they scale together with your organization. With most SaaS solutions, you pay for what you use. Their pricing model is usually based on the number of transactions or the number of users. Make sure to check whether you will have to pay for all users or only active users, and whether there are any pricing add-ons for extra features, heavy use, implementation costs, etc. Cancellation policies also widely differ, with SaaS solutions in general being more flexible than on-premise packages. Related to pricing is the return on investment of different tools. As the different TEM applications have different degrees of automation, the amount of man hours saved will differ. A cheaper TEM tool might therefore not necessarily provide a higher ROI. Return on investment of different TEM solutions according to business solutions review platform G2crowd. The features that are offered by every TEM tool differ strongly. While some applications offer currency conversions, off-line mode, mileage tracking using Google Maps or even automatically import your Uber- or Lyft-ride into your expense report, others only offer basic functions. The more functions your TEM tool has that your employees will actually use, the more time they will save. Another differentiator is the flexibility of tool settings. Not all travel expense management systems allow you to customize their app to your company and needs. Customization is important, however, as it will make your travel expense management tool more user-friendly and easier to use, which will in turn result in higher adoption rates, better expense reports, higher-quality data and more cost-savings. TEM tools can be very useful in helping you unlock many insights about expenses in your company. As expense apps digitize the entire expense management process, it is a small step to turn that data into knowledge. Good TEM solutions provide you with a user-friendly dashboard and help you generate relevant reports and datasets. These could potentially help you save money or increase employee satisfaction. For example, insights about how often your employees use certain hotel or restaurant chains could help you negotiate a discount rate with said chains. Or data on employee spending patterns could help you control and forecast budgets better. While some TEM packages focus on a niche market, others are more general and tailor their product to many different markets and companies. By choosing a TEM tool provider that has clients that are similar to you in terms of company size and industry, you can ensure they will have experience with your needs and will be able to provide you with a performant and well-suited product. A good TEM tool should be easy for your employees to use, so they will probably not need much support. Yet, choosing a TEM provider that offers you a good after-sales service can save you much effort and time down the line in case a problem occurs. Look for companies that have a responsive hotline or chatbot function in your language that is available on your terms. The main benefit of using a SaaS tool lies in the constant updates and maintenance these companies perform on their product. You will always have an innovative and up-to-date software to work with, adapted to changing environments and market trends, without having to update the system yourself. Onpremise software in general requires tedious and timeconsuming manual updates and maintenance, time most IT-departments would like to be spending on something else. However, some SaaS TEM tools update their systems and provide innovations faster than others, so make sure to ask for a roadmap of future innovations and update frequency. Smaller providers with a narrower geographic footprint might struggle to invest to the levels required to build a solution with wider market appeal. Make sure the organization who will take care of your data takes data protection seriously. The gold standard today for data storage in the cloud is using ISO 27001 certified hosting providers, while encrypting data in transit as well as at rest and protection against DDOS attacks and viruses are a must to make sure your data will be safe, and you will always be able to access it. Many SaaS companies also offer solutions for companies which have particular security considerations. Choosing the right travel expense management tool for your company is important, as it will increase satisfaction for traveling employees, save you costs by reducing time spent on filling in and controlling expense reports and provide you with more insights about budget spent on travel in your company. Choosing the right TEM tool might seem like a daunting task, as there are many different options available. However, by narrowing down the options based on our list, you will have your perfect TEM tool up and running in no time. The main differentiator of the available solutions lies in the degree of adaptation to specific countries and sectors, the degree of automation of the whole expense submission process, the integrations offered with your back-office, reporting and data analysis. Don’t feel forced to buy a TEM solution offered by your current provider of office software. While these solutions have the benefit of ensuring a tight fit with your back-office, they might not provide the functionality you are looking for or come with a much higher price tag. 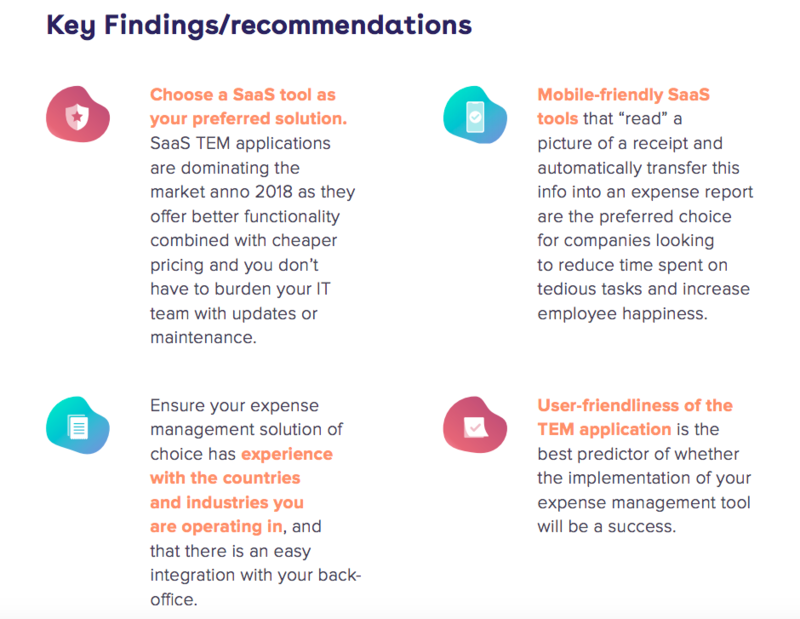 Many specialist SaaS TEM solutions integrate seamlessly with your back-office, while at the same time offering a more user-friendly interface, a mobile application your employees will love, superior functionality and better automation of workflows. Rydoo, for example, is loved by over 500.000 professionals in over 60 countries. 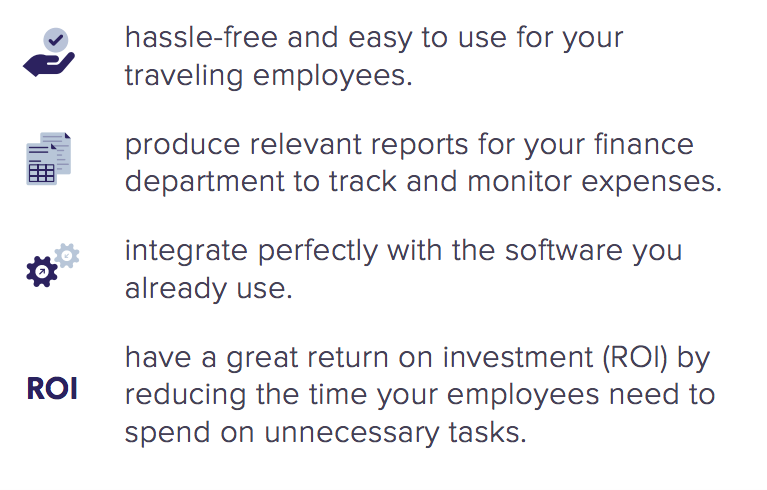 Employees love Rydoo because it is extremely user-friendly, saves them a lot of time and puts the fun back in traveling for business. 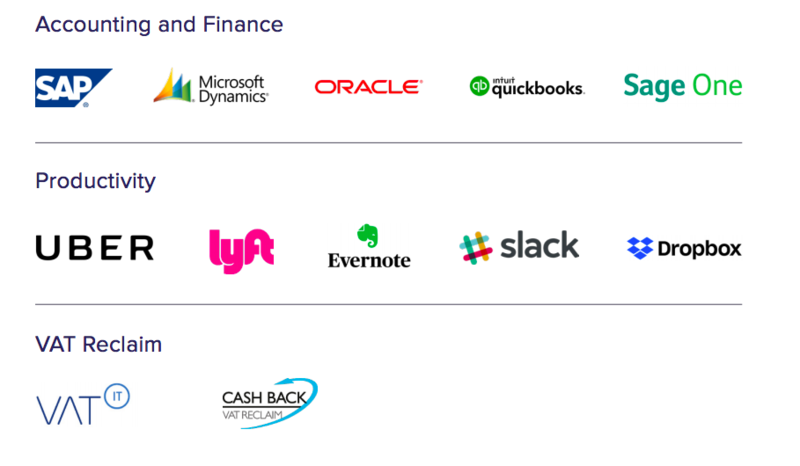 Finance and accounting departments love the seamless integration with their ERP systems such as SAP and Microsoft Dynamics, while IT departments can just lean back and let Rydoo do all the work. Review sites can help you assess what other users think of applications. However, keep in mind that TEM solutions that offer free or freemium versions tend to generate a disproportionate amount of reviews compared to paid versions because of the sheer number of free users. On the flip side they will typically struggle when it comes to offering support, so many negative reviews will likely focus on this issue. Review sites that utilize social profiles like LinkedIn and Twitter offer more confidence than those consisting of anonymous reviews. Reading case studies and analyzing existing reference customers will also help you validate the effectiveness of the solution.